Welcome to A Sampling Bee! 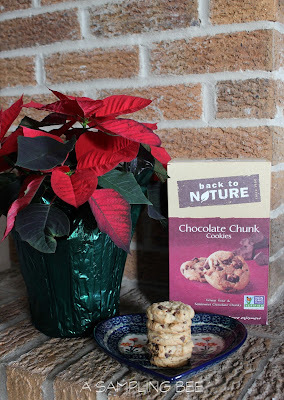 Today, I share with you delicious chocolate chunk cookies from Back To Nature! Back To Nature's mission is to give people truly delicious foods made from recipes inspired by nature. Back To Nature carefully selects all of their ingredients to create the best tasting products. Products that are simply delicious and simply good. Back To Nature Chocolate Chunk Cookies are made with wheat flour, semi-sweet chocolate chunks, dried cane syrup, safflower oil, brown rice syrup, baking soda and sea salt. These chocolate chunk cookies do not contain any hydrogenated oils or high fructose corn syrup. They are Kosher and do contain wheat and soy. A serving of 2 cookies is 130 calories, contains 9 grams of sugar, 2 grams of protein and 70mg of sodium. One package retails for $3.49-$3.99 each. Back To Nature makes one delicious cookie! These cookies are loaded with chunk of chocolate and are oh so crunchy. I love eating them right out of the box or dipping them into a cold glass of milk. The cookies are bite-sized and perfect for kids. My son loves when I put a few of these cookies into his lunch box for school. I have never had a cookie before that was made with wheat flour. I must say, there is no taste difference whatsoever. The chocolate chunks? Are exactly that. Chunks of semi-sweet chocolate! So yummy! I have found my new favorite cookie, thanks, Back To Nature! Back To Nature's Chocolate Chunk Cookies are just the start of an amazing product line. Back To Nature also has granola, juices, cereal, nuts & trail mix, crackers and soups. Visit their website to see all of their amazing products. To find a store near you, visit: backtonaturefoods.com/where-to-buy.